The Genomics Revolution has begun – lets be sure that you’re not left behind. 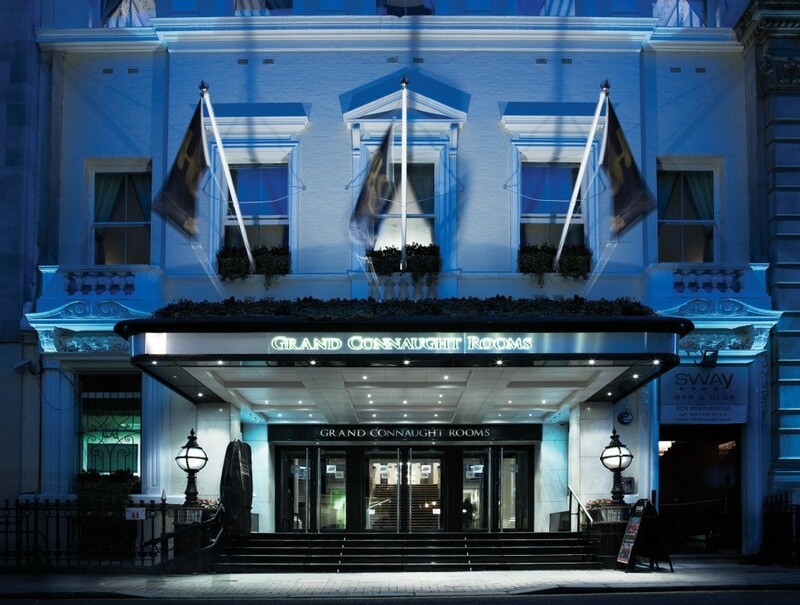 A key presentation on genomics will be delivered by the CEO of Future Genetics who will be attending the Oxford Global event being held at Covent Garden, London. 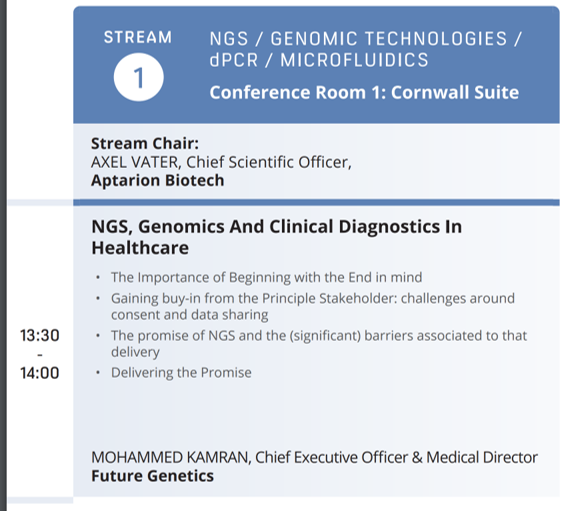 Dr Kamran is an invited speaker on the topic of “Next Generation Sequencing (NGS), Genomics And Clinical Diagnostics In Healthcare“. He was happy to accept the invitation because this is an area of medicine that he is passionate about. During the presentation he will talk about the opportunity that the NHS has in revolutionising the management and treatment of patients with the promise of NGS based personalised care and medicine. Areas covered in the presentation will highlight some of the current challenges related to tackling breast cancer, diabetes, heart attack, stroke, dementia, Alzheimers disease, and the opportunity that NGS presents. Dr Kamran will be placing particular emphasis on the importance of the NHS commitment to reducing healthcare inequalities. He will highlight why it is imperative that the general public become more aware of the absolute need for all communities and ethnicities in the UK to get involved in this emerging genomics revolution. Lets share the message that the NHS belongs to and is there to serve all of us. In order for that to be a reality then we all need to step-up and contribute. Tuesday 22 May. 13.30-14.00. Conference Room 1 (Cornwall Suite). The session will be chaired by Dr Axel Vater who is the Chief Scientific Officer of Aptarion Biotech (Germany). Future Genetics hopes that some of the readers can attend the conference, but appreciate that this is not going to be possible for everyone. The panel discussion will not be recorded unfortunately due to copyright issues, but there will be a summary report of the discussion made available at this website. The event has been organised by Oxford Global. In addition to Dr Kamran, speakers from leading companies have been invited to speak at this event. The two-day conference consists of an educational programme that includes over 60 presentations, postulating topics on scientific, technological and investment growth in the industry. The 2018 Biotech Investment showcase is the UK and Europe’s most focused and leading-edge funding, investment and partnering forum in the biotech sector, hosting over 200 attendees. 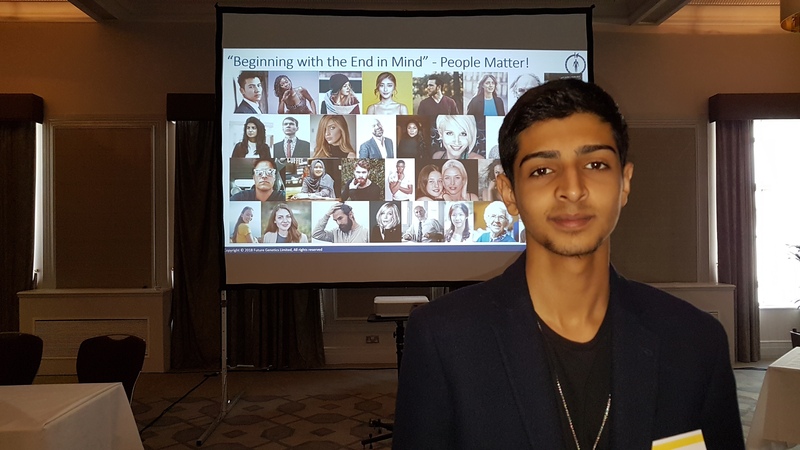 *Post-event update: The session was recorded by our Junior Intern Asad Kamran, so please revisit the site to watch. London is hosting another key conference exploring the opportunities and advances in the biotechnology sector. The event has been organised by Oxford Global – and Future Genetics have been asked to chair the main-stage panel discussion on genomics. Key speakers from leading companies have been invited to speak at this event. The CEO and Medical Director of Future Genetics has been invited to chair an specialist panel discussion titled “Accelerating the Genomics Revolution“. Dr Kamran will moderate this highly anticipated session, where the panel will comprise of Ms Sowmiya Moorthie who is a Senior Policy Analyst at the PHG Foundation, Tommi Lehtonen (CEO, Blueprint Genetics) and Mr Ali Mortazavi (CEO, Silence Therapeutics). 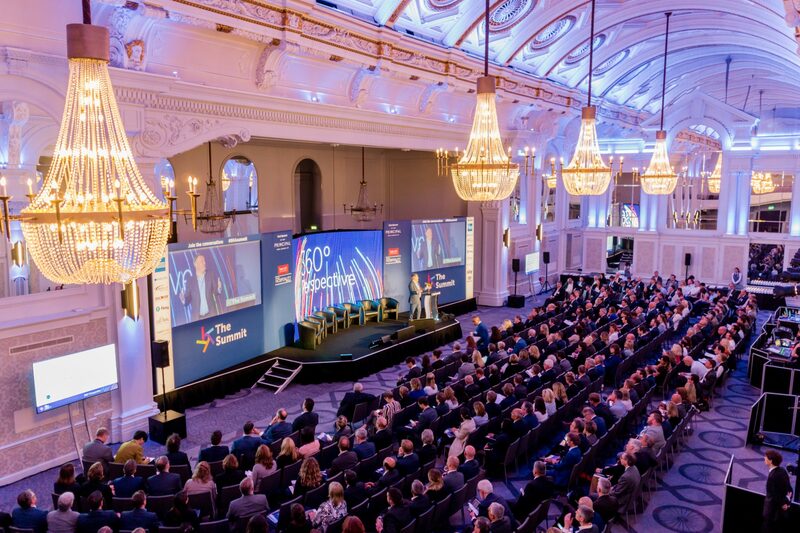 The two-day conference consists of an educational programme that includes over 60 presentations, postulating topics on scientific, technological and investment growth in the industry.The 2018 Biotech Investment showcase is the UK and Europe’s most focused and leading-edge funding, investment and partnering forum in the biotech sector, hosting over 200 attendees. Leading Venture Capitalists, funds, investors, hedge funds, emerging successful biotech spinoffs, early stage biotech discovery and clinical companies and KOLs in the sector will be attending this one of a kind showcase event on the 22nd & 23rd May 2018 in London. It is anticipated that the event will help to identify the key technological and scientific investment areas.